Oiko Visual CSS editor is a Free Portable CSS editor. 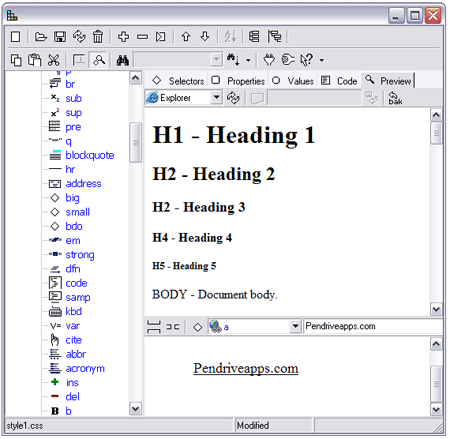 It is essentially a visual CSS editor that helps you edit or design your style sheet (CSS) code from a visual or graphical interface without the need to know code. Making up the principle design of many websites, CSS (Cascading Style Sheets) make for a simple and easy to navigate structure for specifying style (colors, fonts, location, spacing etc) in HTML, XHTML, XML web based documents. The Oiko CSS editor utilizes icon type navigation and comes with a preview option that allows you to see how your stylesheet changes will look in the Internet Explorer or Firefox Browser.